Helen and Michelle here. It's time for our February and March favorites. We have been loving quite a few products in these past 2 months and we couldn't wait to share with you all. Out of these 7 products, 5 of them are our shared favorites and we each added one of our own favorites to the list. So without further ado, let's get started! 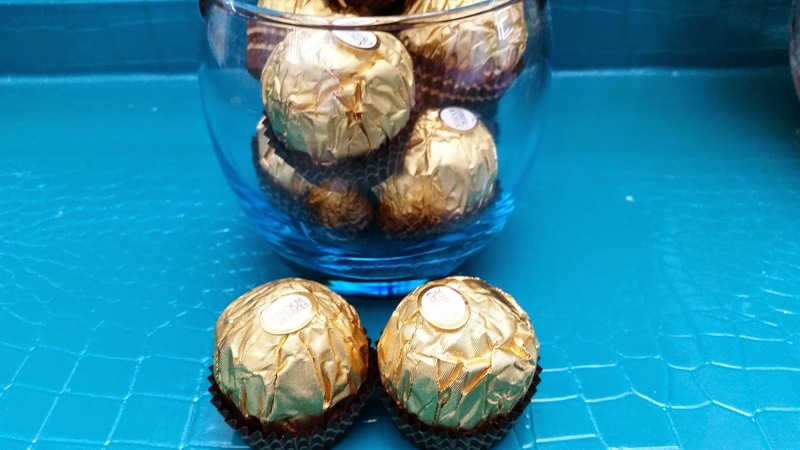 Our favorite chocolate in these past 2 months has been these yummy Ferrero Rocher. They have been our favorites on and off because we'd eat too much at once and get sick of it for a while, then fall back in love with them all over again. It's hard to not like these yummy little gems when you love chocolate. They are packaged beautifully and their taste is just unique and oh-so-delicious. In case you've never had Ferrero Rocher (in which case we think you are missing out, unless of course you are either allergic to its ingredients or hate some of its ingredients), we'll try our best to describe it to you. As you can see, the chocolate is round. At the center of this yummy gem is a whole hazelnut that is encased in by some delightful hazelnut cream. Surrounding the cream is a light layer of wafer that forms the shape of a sphere. On top of the wafer is some delicious chocolate and finally, it is topped off with crushed nuts. Sounds delicious, doesn't it? Ferrero Rocher is made by an Italian company called Ferrero. They make all sorts of hazelnut confections, one of the products they are best known for is their Nutella. Which we love, by the way. You might also be surprise to find (like we were) that Ferrero also makes Tic Tacs. Yup, the company that makes amazing chocolates also make bite-sized candy and mints Interesting huh? 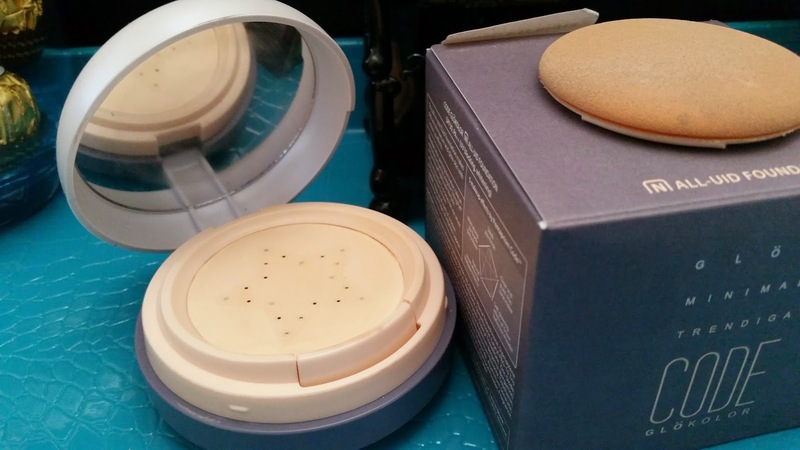 Michelle: When I first got this cushion foundation, I fell in love. It was the first cushion-like (although this is not a true cushion product) foundation I've tried since I heard about the BB cushion trend. I took a break from it when I got my Innisfree cushion, however, I found myself loving it a lot in February and March. 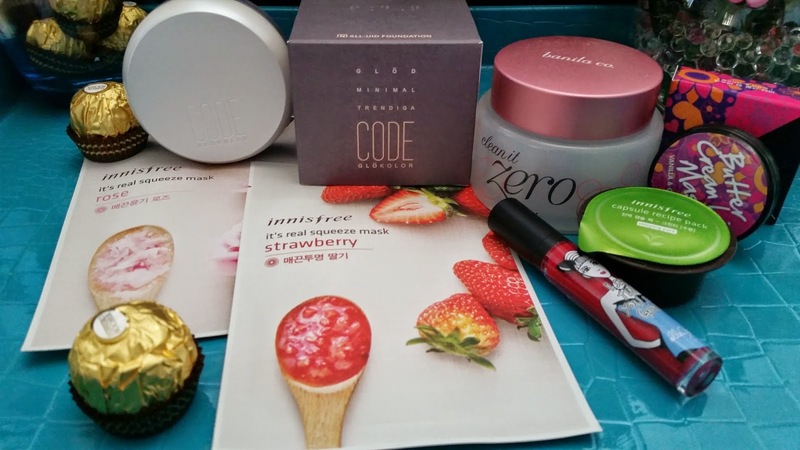 I've been using it interchangeably with my Innisfree Ampoule Intense Cushion. I usually wear this one on days when I want a bit more coverage or when I want a not-so-dewy finish. While it is bulkier than other cushions, I like that this product does not have a sponge-like base, but rather a pump like base. It seems a little more sanitary and I can choose to mix my foundation with a bit of moisturizer on days when I need more moisture. I also love the cute star pattern on the pump. I have an entire review on this product if you are interested in finding out more! We both have been loving Innisfree sheet masks these past couple of month. It's not only cost efficient but also feels amazing on our faces. Both of these masks are great at adding radiance to our complexion. The Rose mask and the Strawberry mask also works to add suppleness to the skin, which is great for late winter/early spring times. 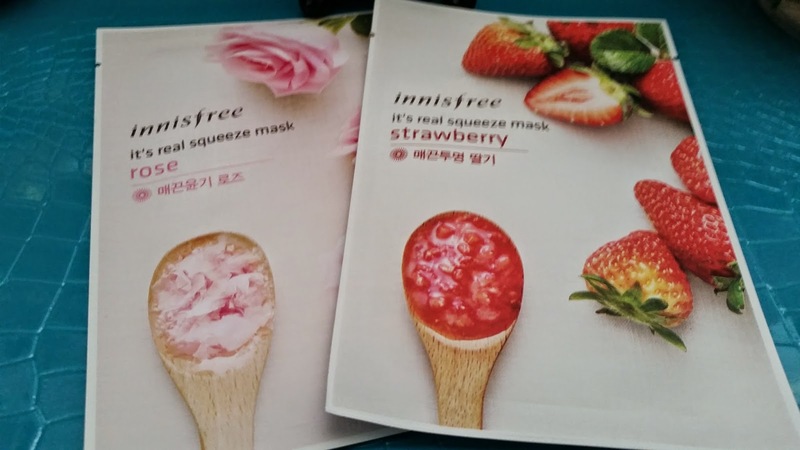 Due to their not-so-expensive prices and Innisfree's ever so often sales, you can stock up on these masks without feeling guilty! We are definitely running low on them and will be buying plenty more during Innisfree's next sale! We both have been loving the double cleanse method ever since we decided to give it a try. We each got out own Clean It Zero balm and have been loving it a lot. This cleansing balm has been raved about all over the internet, so we knew we had to try it. And man oh man did we fell in love it with. 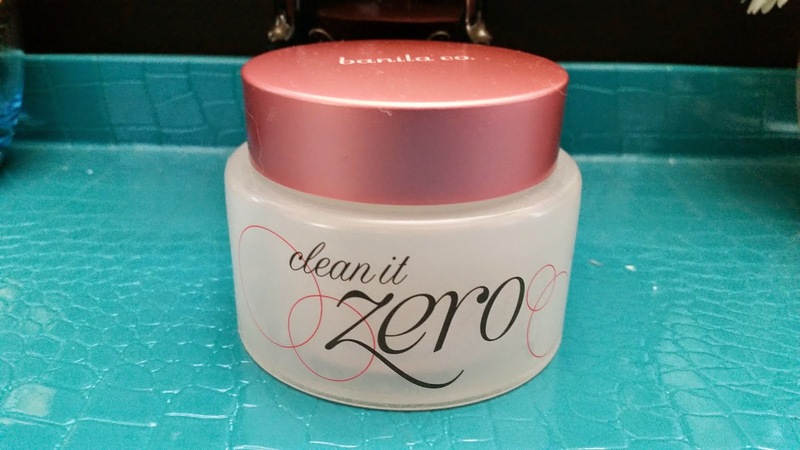 The Clean It Zero balm works great as a first step in cleansing off makeup and impurities before following it up with a foam cleanser. There are 4 kinds of Banila Co. Clean It Zero cleansing balms and the one featured above is the classic version. The other 3 types are: Radiance, Purity, and Resveratrol. We could love to try the other 3 in the future to compare! Another product that we both love. No one likes snakeskin like lips that peels and flakes like crazy. Especially when lip balms are not helping and lip scrubs might be too harsh on it. In this case, it's lip masks to the rescue! 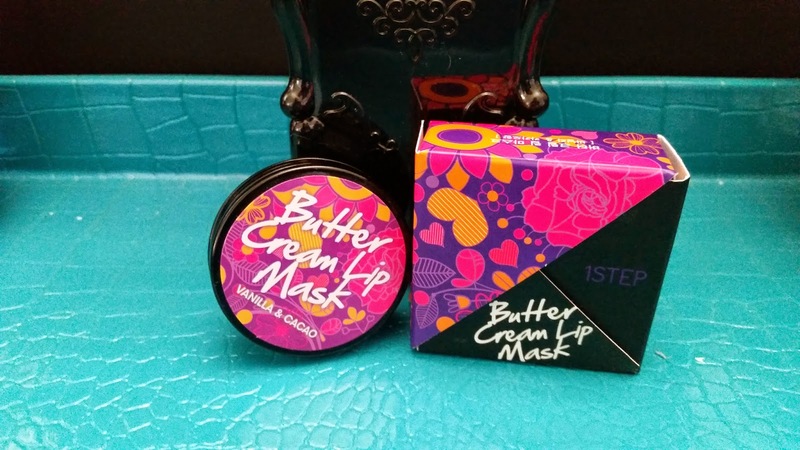 We both have been loving this Butter Cream Lip mask, so much so that we now have 2 spare ones on hand. Not only does this lip mask woks wonders on our dry and chapped lips, it also smells delicious. Plus it is not harsh on the lips at all. Feel free to check out our full review on this MD.Aida Butter Cream lip mask. Helen: My daughter wrote a review on this tint gloss she received in her Get K-Beauty Box late last year. The more I read about it, the more I wanted to try it. So, when I had the chance, I ordered one in the same color (Rock Berry) as the one she had, just because I like it a lot. I tried it the day my mailman delivered it and have been wearing it just about every day in these past 2 months. I was always a lipstick person (still am), however, this tint gloss is my only exception. It is truly an amazing product that everyone should try. 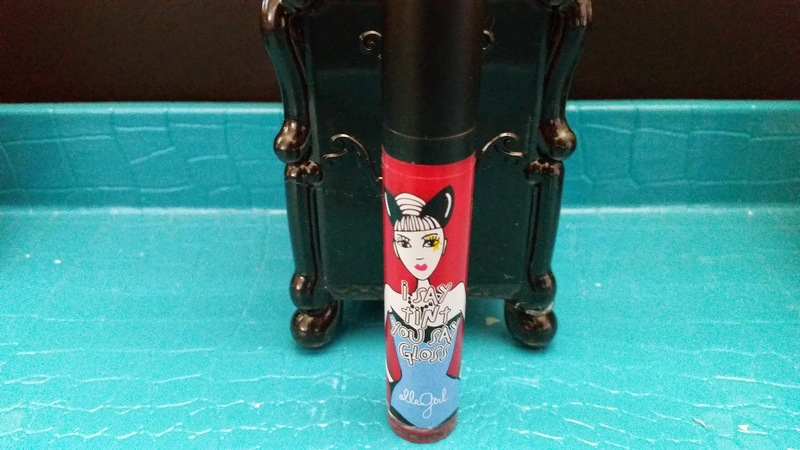 The color looks beautiful and it lasts on the lips quite nicely. The scent this tint gloss have is very delightful as well. This sleeping pack might look small, but its functionality are certainly not small at all. Plus, it is very affordable, so you won't feel like it's breaking your bank. We both love green tea in our skincare products. Actually we love green tea in general. We usually try to drink green tea every day, if not, at least every other day. Green tea has many benefits as it is loaded with antioxidants and nutrients that can positively affect the body. 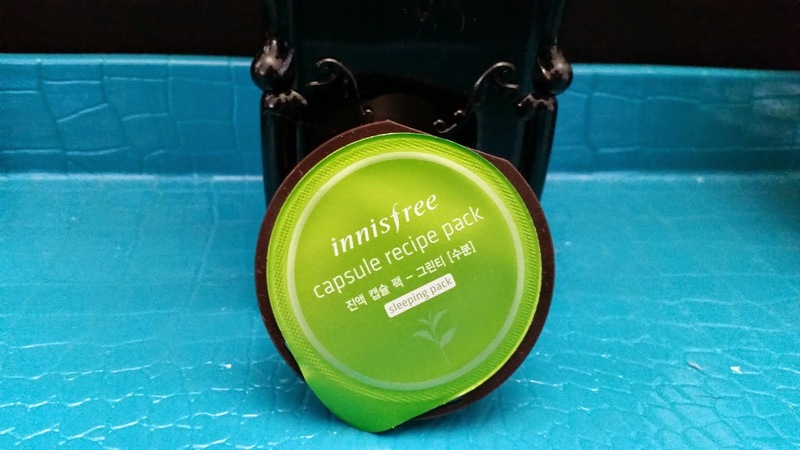 Innisfree's Capsule Recipe Green Tea Sleeping Pack is packed full of goodies for the skin and it is perfect as the last step for a nighttime skincare routine. Check out our full review on this wonderful sleeping pack! That is it for our favorites of February and March. We sure do wonder what our favorites in April will be! Now it is your turn! Tell us what your favorites were in the months of February and March. Or, share your thoughts, if you've tried any of the products mentioned in this post. Disclaimer: These products was purchased by us with our own money, all opinions are honest and our own. 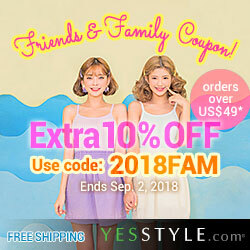 This post contains affiliate links, full disclaimer here.